LONG BEACH, Calif. – Jan. 29, 2014 – The phone rang shortly after Steve Fewell of CS Photography delivered a high-volume job of student portraits and class photos created with his new in-house Epson® SureLab® D3000 professional dry lab. A school administrator was on the line commenting about this year’s “exceptional print quality” and asking if Fewell got a new camera. “No, I just switched to my own in-house lab,” replied the photographer, who co-founded CS Photography in Louisville, Ky. 15 years ago with his wife Marsha Fewell. Today, the small studio serves a variety of public schools throughout the most populous city in Kentucky, specializing in school events, yearbook photos and lifestyle portraits. 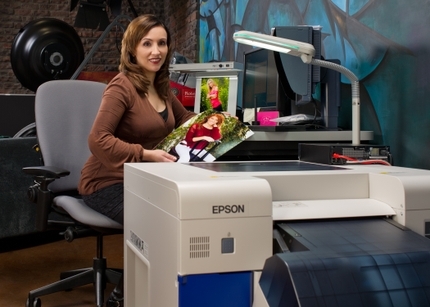 A new chapter began when Fewell found the Epson SureLab D3000 professional dry lab, a complete solution for photography studios to produce high quality production prints at fast speeds, with a significantly lower cost-per-print and total cost of ownership. “Our small business’s ongoing focus has always been on quality, service and value, so adding the Epson SureLab to our studio was another smart business decision,” he said. For years, Fewell saw inconsistency in the image quality produced by the chemical-based photo labs he used to make customer prints. After photographing up to 2,000 students in four hours, he and his team would return to upload, color manage and retouch in-house, but they forfeited control once the files went to the lab. “Despite our best efforts, I seldom saw a perfect print match come back from the wet lab,” he said. Fewell also noticed the parents and students who purchased his photos were paying more attention to print quality because they were using photo-sharing apps and applying digital filters on their own. “Digital has dramatically changed photography, but in our part of the photo market, the bottom line for our customers is still that print,” said Fewell. As CS Photography evolved, Fewell knew he had to provide prints that better matched the color and quality of the images on his computer monitor. For years, he had his eye on dry digital printing technology, but the dry labs available were beyond the means of a small business. “At the time, I just couldn’t justify the purchase cost for a studio my size,” he said. When Fewell discovered the Epson SureLab D3000 dry lab, he realized his business could profitably deliver large volumes of high quality prints and meet his high standards for quality at a lower cost-per-print. “For the first time, I had a feeling of total control over the entire process,” he said. The SureLab D3000’s simple, compact design fit right into his studio and turned it into an onsite photo lab. His team was able to print a variety of different sizes up to 12 inches wide, from 8”x10” pages of wallet-sized photos, to 5”x7” or 4”x5” sizes, to 12”x48” class picture panoramas. With the SureLab D3000, CS Photography can produce up to 260 8”x10” prints per hour and up to 650 4”x6” prints per hour1 at its own convenience without lab fees or delays. The printer uses Epson’s MicroPiezo® print head technology with variable droplet sizes as small as 1.5 picoliters. For use exclusively with six-color Epson UltraChrome® D6 ink cartridges and not with any other inks or cartridges2, the SureLab produces water-resistant prints image quality beyond traditional chemical-based photo labs that will last for generations.3 The dry lab is available in a single- or dual-roll configuration, and either unit can be coupled with an optional 10-bin sorter. For more information on Epson’s complete line of professional printers and papers, including the SureLab D3000, visit www.proimaging.epson.com.